Sometimes we happen upon something in nature that is beautiful in the moment. And then when we return, that beauty has faded or disappeared. 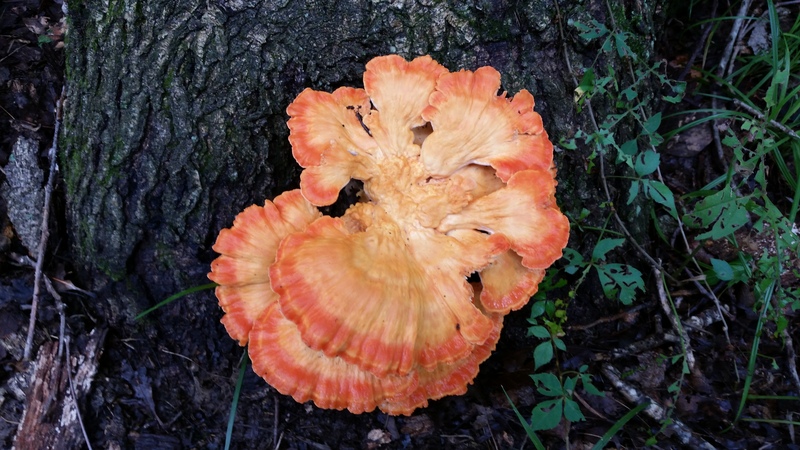 This is a bright orange shelf fungus I discovered in my back yard while I was putting some things away. In two weeks, I am going to present at a fortune 100 company as part of their diversity program. I have a half hour for my presentation and a four-by-eight table on which to place pictures or things. I get to talk about being “Indian”. (In my case, being a member of the Red Lake Band of Chippewa Indians, and having ancestors from the Red lake, Leech Lake and White Earth bands as well.) I suppose my audience will be people I’ve met from a relative’s department, and perhaps some of the big wigs from the company. Having lived on and off the reservation and having degrees in American Indian Studies and psychology, it would be easy for me to come up with my perception of what being Indian means. However, as part of the presentation, I would like to know and present two things. 1) What you would like to know about a person/people from these cultures if you are not from there, and 2) what you would like other people to know if you are. For fellow Anishinabeg, I’m aware that we come from many different reservations, reserves, places and experiences, and want to take this into account. But I need your input in order to do so. If you would like me to keep your replies confidential, I can do that, as this blog is set up so that I have to approve, and can edit, your reply before posting it. I would however like to use your reply and at least note where it comes from.